The Indian economy is likely to expand between 6.75% and 7. 5% in the fiscal year that begins in April, the government said in a report on Tuesday, as it expects growth to pick up after slowing this year. The growth projections in the annual Economic Survey, tabled by finance minister Arun Jaitley in Parliament, indicate that the Narendra Modi government is hoping that the impact of its shock decision to scrap high-value banknotes overnight to fight graft and tax evasion will be temporary. The survey estimates will underpin the government’s budget for 2017-18, which Jaitley will present on Wednesday. The finance ministry separately tweeted that economic growth is “expected to return to normal” as new currency notes in required quantities come back into circulation. The estimate for next fiscal year is broadly in line with this year’s projections. Earlier this month, the government projected economic growth for the year through March to slow to 7.1% from 7.6% in 2015-16. This estimate, however, didn’t take into account the impact of Prime Minister Modi’s decision in November to withdraw 86% of the currency in circulation that crimped consumption and output. The note ban has prompted several economists, ratings firms as well as the International Monetary Fund to trim their growth forecasts for Asia’s third-largest economy. The IMF has slashed its estimate for growth in 2016-17 to 6.6% from 7.6% earlier. The survey, prepared by chief economic adviser Arvind Subramanian, said that the main reason for slower growth in the current fiscal year was a drop in fixed investment, as stressed balance sheets in the corporate sector continued to take a toll on firms’ spending plans. The survey also pointed to three major risks to growth—a rise in crude oil prices, demonetisation and trade tensions among major countries. But it says that the government will reap a fiscal windfall from the invalid currency notes not returned to banks after demonetisation. This is surprising because, even though the Reserve Bank of India has not issued an official statement on how much of the banned banknotes came back into the banking system, news reports have said that nearly all the demonetised currency that was in circulation made its way to the banks. Separately, citing the survey, Subramanian tweeted that demonetisation has had short-term costs but holds the potential for long-term benefits. He suggested follow-up actions to minimise the costs and maximise the benefits. These include tax reforms and bringing the real estate sector under the planned goods and services tax. 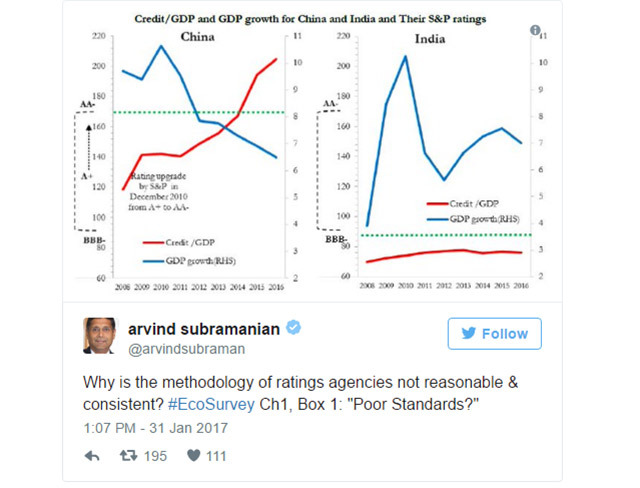 Subramanian also took on the credit ratings firms such as Standard and Poor’s, Moody’s and Fitch, which have refused to upgrade India’s sovereign ratings despite the government’s multiple requests. 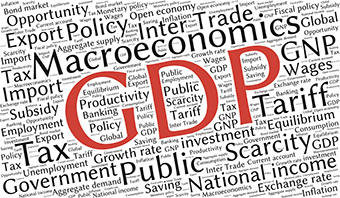 The survey questioned the ratings firms’ methodology and their refusal to upgrade India’s ratings on the grounds of low per capita gross domestic product and relatively high fiscal deficit. “India has a strong growth trajectory, which coupled with its commitment to fiscal discipline exhibited over the last three years suggests that its deficit and debt ratios are likely to decline significantly over the coming years,” the survey said. India also compares favourably to other countries on other metrics known to be closely related to the risk of default, the survey said. However, India’s ratings have remained stuck at the lowest investment grade of BBB-, it added. The survey also suggested discussing a proposal to introduce a Universal Basic Income for all citizens as part of efforts to reduce poverty. This is "a powerful idea”, the survey said, but would cost 4-5% of GDP and is “not ripe for implementation”.